A happier work culture develops with strong and frequently made personal, emotional connections. Why? Because people are willing to work harder and to commit to organizations that their friends are a part of. It’s one thing to disappoint your boss, but another to let a friend down. According to Gallup’s 2017 State of the Workplace report, if 6 in 10 U.S employees had a best friend at work, organizations could realize 36% fewer safety incidents, 7% more engaged customers, and 12% higher profit. Bestselling author and psychologist Mihaly Csikszentmihalyi named the concept of ‘flow’, which is known as a highly focused mental state. Have you ever worked on a task and were just totally ‘in the zone’? The difference between working a lot and being in flow is that the latter brings you genuine satisfaction when you’re continuing to make progress. Even though we work remotely, our DH team has to set boundaries to make sure we aren't being interrupted with Slack messages. Since we're all accustomed to working independently, we all have to figure out how we can best manage communication at a distance and maintain 'flow'. Raise your virtual hand if you’ve been guilty of sending an email after work hours or while on vacation? Even worse, have you requested a response of a team member or colleague while they were out-of-office? Not only can this behavior bite into your culture, but it can pressure your employees to always be in ‘work mode’ when they’re trying to achieve a healthy work-life balance. You can’t have a balance if your mind is always thinking about work! 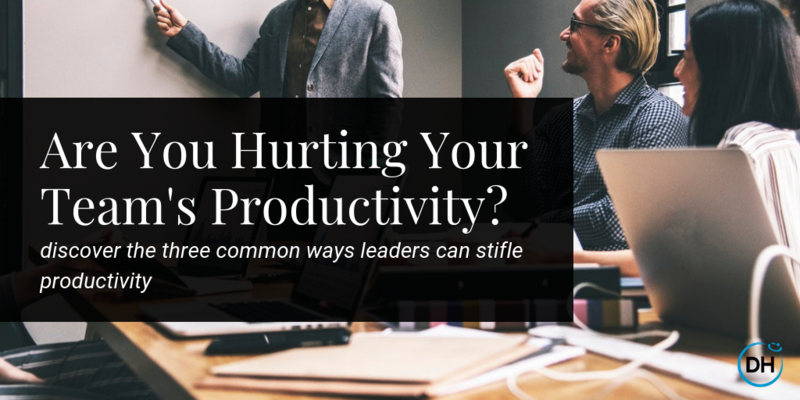 Not giving your employees a break will sooner or later result in burnout, which can negatively affect productivity and hurt the way your teams see their work. So as a manager, if you’re texting, calling, emailing when your employees are not working, save your thoughts for 9am on Monday morning.